As we have said before, we have often had long gaps between asset releases on previous games and will continue to do so in the future. We are sorry if you find this frustrating, but please understand, we don't do this because we ‘don't care about our fans' 'don't respect our fans' 'hate GTA fans etc' – precisely the opposite! We do it because we want to make sure we only release 100% correct information, and because we want to keep plenty back for the actual game release so there are still lots of surprises when you play it. The only things we care about are that you enjoy the experience of actually playing the game and that we release accurate information. We just have not been in a position to show more of the game than the trailer and will not be for a while yet. We did, however, manage to sneak a quick screenshot out for you… it's not much, but we thought it was pretty fun. UPDATE: One more tidbit from Rockstar's Q&A confirms what the game's first trailer implied. 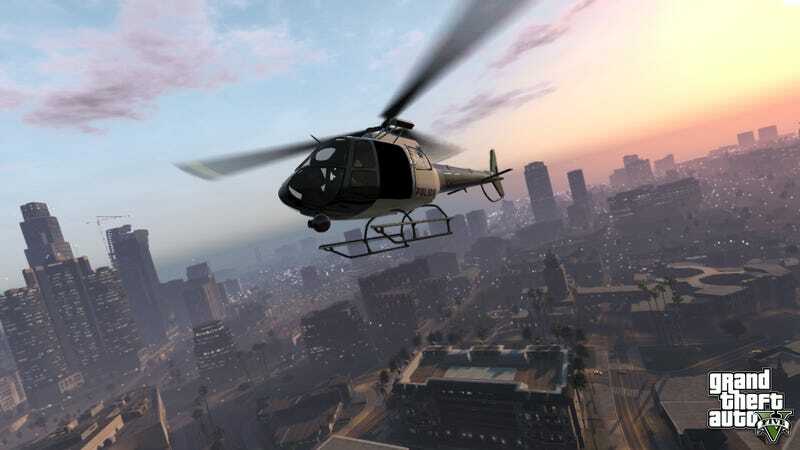 We'll be flying planes in GTA V. In response to a question about the omission of planes from GTA IV, Rockstar said: "... we simply could not make an environment big enough for planes to work properly. Fear not, they are returning in what is our biggest open world game to date."